The Tier 3 Towtector is perfect for those that want EXTREME protection for both their vehicle and towable. A huge cut above all the other mudflaps on the market, the Tier 3 Towtectors protection gets EXTREME results. When you are really serious about keeping whatever you are towing protected from flying rocks and debris - you want the Tier 3 Towtector. The Tier 3 Towtector has two brush strips on each wing, that catch and drop debris, we know you’ll agree it offers better protection than any conventional mud flap. Why? Because unlike our competition, the Tier 3 Towtector spans nearly the entire width of your vehicle - instead of just the width of the tires. This extra coverage protects your towable from the debris that flys between the rear wheels of your vehicle. 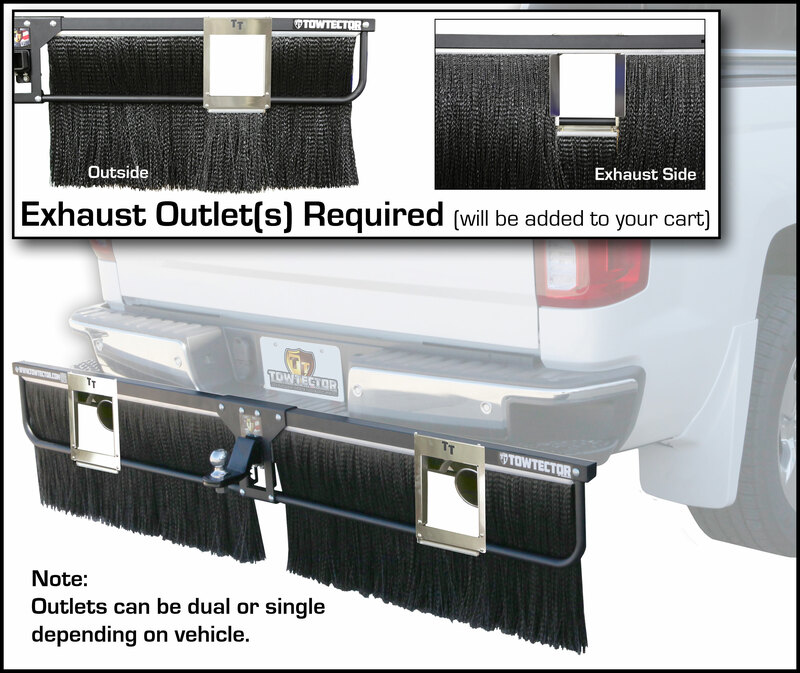 In addition to the added width protection, as stated above, the Tier 3 Towtector is manufactured with dual brush strips - these brushes ability to catch and drop debris, aids in keeping flying debris from bouncing back into the undercarriage of your vehicle further protecting it - and not giving that debris a second chance to damage whatever you are towing. Through our history of producing 1000's of Towtectors we have identified vehicles that - due to their specific kind of exhaust system, can potentially damage your Towtector. Similarly, we know that your vehicles exhaust type can damage other traditional mud flaps as well. So, we responded to our customers needs by being the only manufacturer to make a special addition perfectly suited to your vehicle. The addition of a exhaust outlets direct the heat away from your Towtector, saving your hard earned money on replacement -and making it last for years to come. Purchase with confidence from a manufacturer that knows YOUR vehicle.